(Nanowerk News) Solar cells made out of lead sulfide quantum dots could eventually offer a cheaper, more flexible alternative to ones made using silicon, but they are currently much less efficient. However, altering the chemical composition of quantum-dot solar cells offers a way of tuning them to reach higher efficiencies, MIT physics graduate student Patrick R. Brown says (ACS Nano, "Energy Level Modification in Lead Sulfide Quantum Dot Thin Films through Ligand Exchange"). "Instead of starting with a high-efficiency technology and then trying to make it cheaper, which is what we're doing now with silicon, our plan is to start with something that we know we could make cheaply and see if we could make it more efficient," Brown explains. Lead sulfide is plentiful, occurring naturally in the mineral galena, and the world currently produces enough lead and sulfur in the span of a few weeks to build lead sulfide solar cells to supply all the world's electricity, Brown notes. Other alternatives to silicon such as cadmium telluride or copper indium gallium diselenide (CIGS) have the disadvantage of using costlier and less-abundant starting materials. Lead sulfide quantum dots have another advantage over other emerging thin-film solar-cell technologies like organic polymers and perovskites in that they are stable in air. "I'm focusing on trying to figure out what are the knobs that we have to turn on this material that will then enable us to get to higher efficiency," Brown says. Quantum dots are nanoscale crystalline semiconductors whose bandgap changes with their size. The bandgap determines which regions of the solar spectrum — which contains ultraviolet, visible, and infrared light — that the quantum dot solar cells can absorb and convert to electricity. Brown's recent collaborative research with MIT Professor Vladimir Bulovic and five others demonstrated how attaching different organic molecules, or ligands, to the surface of quantum dots can modify their energy level. Brown fabricated and studied his lead sulfide quantum-dot solar cells in Bulovic's Organic and Nanostructured Electronics Lab. When sunlight strikes a semiconductor in a solar cell, it can excite an electron from its tightly-bound ground state in the "valence band" into less-tightly-bound states in the "conduction band," where the electrons can move freely and generate an electric current. Brown studied the influence that different chemical ligands have on the ground-state energies of electrons in the quantum-dot valence band. Using a technique known as ultraviolet photoelectron spectroscopy in the lab of MIT Professor Marc A. Baldo, Brown measured the differing electronic properties of lead sulfide quantum dot films treated with 12 different chemical ligands. The results show that these surface ligands act as tiny electric dipoles — the electrical equivalent of the familiar bar magnet — and thus can influence the energy of the electrons within a quantum dot. "In our work, we show that as you change the surface ligands, you can leave the bandgap the same, but change the absolute energy levels," Brown says. The ability to tune both the size of the quantum dot and its surface chemistry can guide the design of efficient solar cells and, eventually, multi-junction devices that absorb more of the sun's spectrum. "With this ability to tune the energy levels of the quantum dots by changing the ligands, we can make sure that there are no energetic barriers in our device and that the electrons have a downhill energetic path out of the device," Brown explains. "The ability to tune these properties using such simple chemical processes is what sets these materials apart, making them a unique and promising choice for use in solar cells," Brown says. Brown and MIT materials science graduate student Donghun Kim were co-lead authors of the paper, "Energy Level Modification in Lead Sulfide Quantum Dot Thin Films through Ligand Exchange," published in ACS Nano in June 2014. Other co-authors were MIT Professors Vladimir Bulovic, Jeffrey C. Grossman, and Moungi G. Bawendi, as well as Richard R. Lunt, assistant professor of chemical engineering and materials science at Michigan State University, and Ni Zhao, assistant professor of electronic engineering at the Chinese University of Hong Kong. Brown, 27, is in his sixth year as a physics graduate student and expects to get his PhD during 2015. He received his BS in physics and chemistry at the University of Notre Dame. Brown is a National Science Foundation Fellow as well as a Fannie and John Hertz Foundation Fellow. Kim used atomic-scale computer simulations to model the interactions of the chemical ligands with the quantum-dot surface. These simulations explained a key result of the study, showing that the differing electric dipole moments of the ligands are responsible for the changes in quantum dot energy levels. "Regardless of the way that a specific ligand binds to the quantum dot surface, Donghun's simulations showed a shift in energy levels that matched the shifts that we were measuring experimentally," Brown says. Quantum dots do have their disadvantages, of course, which is why this technology hasn’t yet hit the market. “Electrons have a harder time hopping between quantum dots than they do traveling through a pure, uniform crystal of silicon. While the materials we are using are very cheap, the difficulty in moving charge through them leads to low solar cell efficiencies,” Brown says. For example, electrons can get trapped on the surfaces of quantum dots. “One thing we want to do is figure out what kind of chemical tricks we can play at the surface of the quantum dot to get rid of those trap states,” he says. 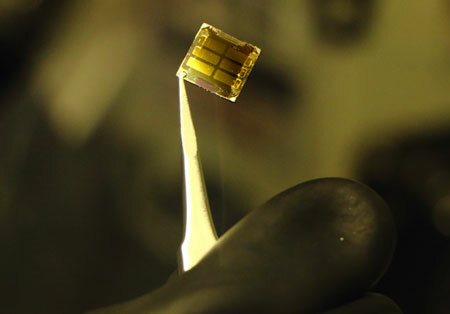 The long-term goal of the research is to use the tunable electronic properties to make higher-efficiency lead sulfide quantum-dot solar cells that are flexible and able to be manufactured at low cost, Brown says.